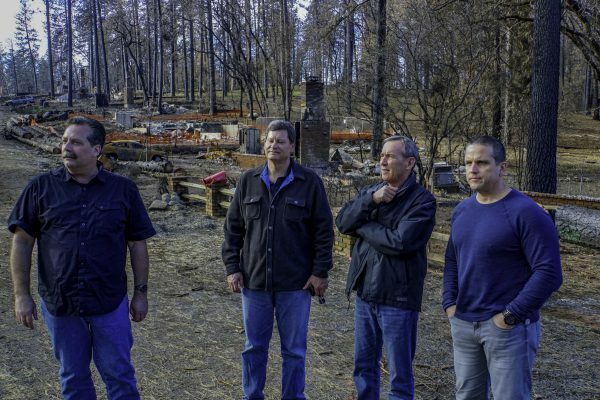 Last week, Laguna Beach city officials toured neighborhoods destroyed by the Camp Fire in Paradise, Calif. in an effort to learn how the city might better prevent and react to its next wildfire. A contingent of Laguna Beach city officials toured the town of Paradise, California, on Jan. 23 to witness the devastation caused by the Camp Fire last November and to learn how the city might better prevent and react to its next wildfire. Left to Right: Laguna Beach City Manager John Pietig; Ron Quigley, Interim Regional Administrator, CA OES; Shem Hawkins, Battalion Chief, Cal Fire/Butte Co. Fire Dept. ; Laguna Beach Wildland Fire Specialist Mike Rohde; Jeff Toney, Regional Administrator, CA OES, Southern Region; Laguna Beach Police Captain Jeff Calvert, Emergency Operations Coordinator Jordan Villwock; Laguna Beach Mayor Bob Whalen; Public Works Undergrounding Program Manager Wade Brown; and Laguna Beach Fire Chief Mike Garcia. Mayor Bob Whalen, City Manager John Pietig, Fire Chief Mike Garcia, Police Capt. 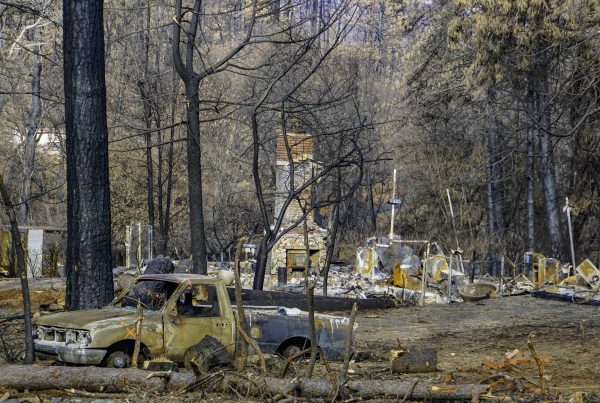 Jeff Calvert, Emergency Operations Coordinator Jordan Villwock, and Utility Undergrounding Program Manager Wade Brown made the journey to the Camp Fire’s burn area that saw 86 people killed and more than 18,000 structures destroyed. 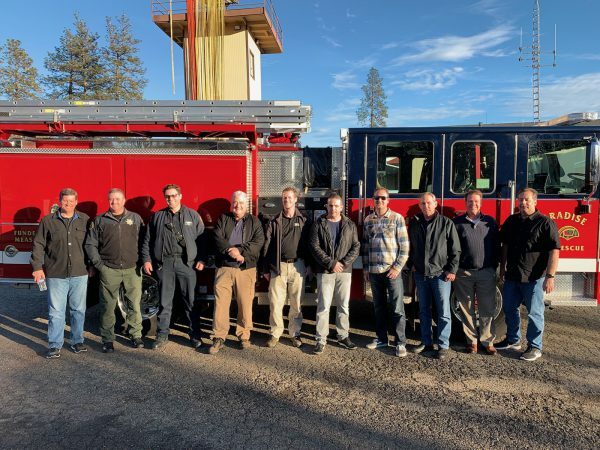 Laguna Beach officials met with Butte County Fire Department Battalion Chief Shem Hawkins, who observed the Camp Fire from helicopter 30 minutes after it started. Hawkins described how the extremely high wind speed made firefighting with aircraft ineffective. Even though Paradise is surrounded by an inland pine forest, its topography shares some similarities with Laguna Beach. The town has three roads for people to evacuate and has box canyons, like Bluebird Canyon, where there is only one road out. Paradise also has many dead-end streets like those in Laguna Beach. 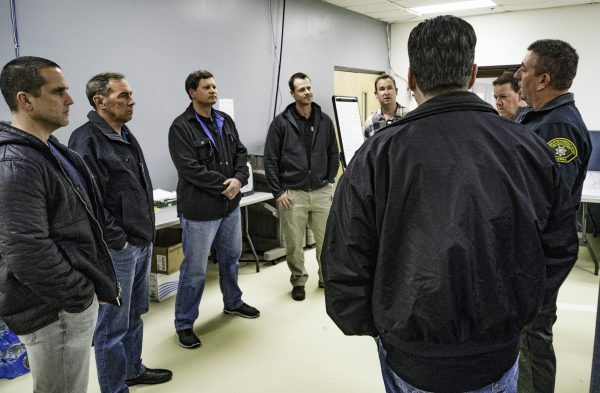 Ron Quigley, Interim Regional Administrator, California Governor’s Office of Emergency Services, Inland Region (Law Branch), explains the recovery operations and process to Laguna Beach city officials at the Joint FEMA and California Office of Emergency Services (Cal OES) office in Oroville. Villwock said firefighters in Paradise encountered roads that were blocked by downed utility poles, live power lines, and trees. A couple of firefighters had to use front-loader tractors to push debris out of the road so residents could drive out. Unlike Paradise, Laguna Beach has neighboring cities that could provide mutual-aid from their police departments to Laguna Beach Police in the event of a wildfire. The small mountain enclave only had a few officers on duty to help evacuate residents when the Camp Fire started. 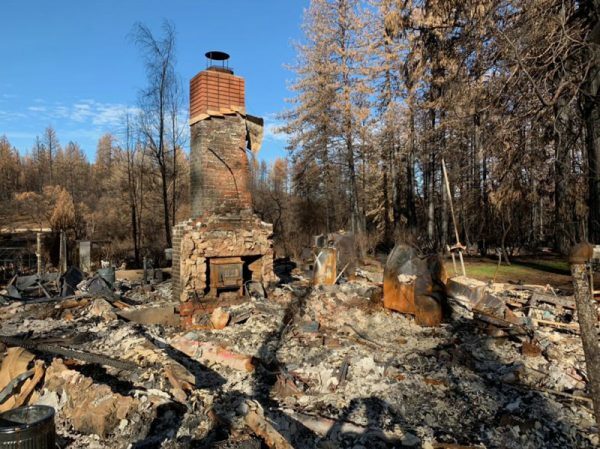 One of the biggest failures of the Camp Fire is that many residents didn’t receive emergency alerts from Butte County, or received them too late because the fire moved so fast. Laguna Beach was the first city in Orange County to implement a wireless emergency alert system that allows city officials to send an Amber Alert-style message to cell phones pinging cell towers in the city limits. The County of Orange can also make emergency calls via AlertOC to all landlines in Laguna Beach and to residents’ cell phone numbers who opt-in to receive alerts. AlertOC currently holds 17,430 registered numbers, but only about 19 percent of those are cell numbers, Villwock said. If residents are unsure if their cell number is registered or they recently changed their cell number, they’re encouraged to sign up at alertoc.com. The Laguna Beach City Council recently formed a Fire Safety Subcommittee to conduct a comprehensive review of the city’s emergency evacuation and response plans. The subcommittee will meet in private with city staffers for the first time Feb. 8 and is expected to report its recommendations to the City Council in June. Whalen said the subcommittee will likely discuss improving evacuation routes, vegetation management, and staging firefighting equipment on high-wind days. Only ashes and chimneys remain in Paradise neighborhoods. 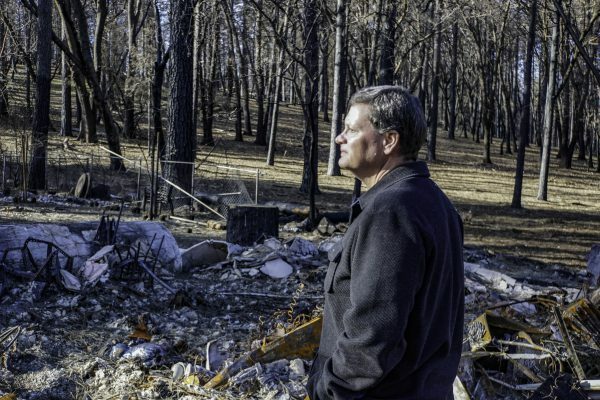 Laguna Beach City Manager John Pietig tours fire-ravaged neighborhoods in Paradise, California on Wednesday, Jan. 23. Left to Right: Laguna Beach Fire Chief Mike Garcia; City Manager John Pietig; Laguna Beach Mayor Bob Whalen; and Laguna Beach Police Captain Jeff Calvert. 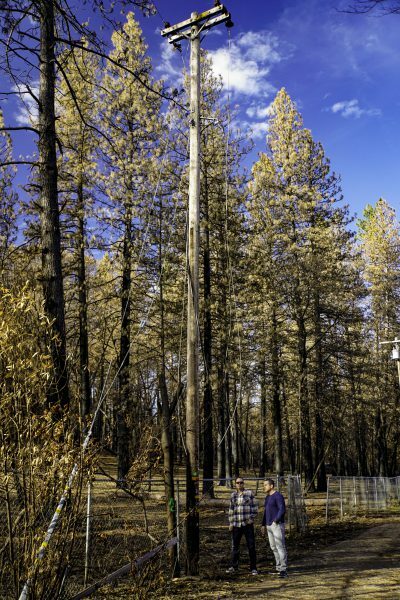 Emergency Operations Coordinator Jordan Villwock (left) and Captain Jeff Calvert (right) stand near a utility pole in the Camp Fire rubble. City officials learned there were over 1,000 utility poles and power lines that fell across roads and streets during the Camp Fire, blocking evacuation routes. Cal Fire/Butte Co. Fire Dept. 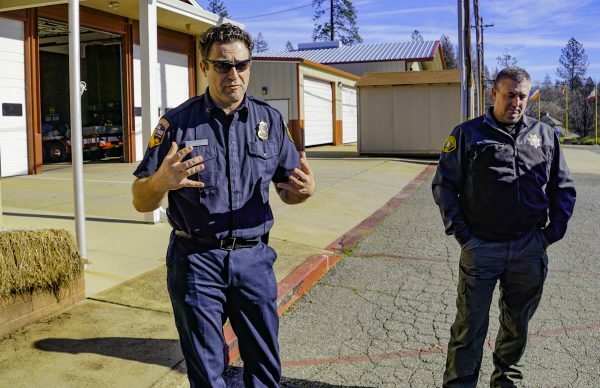 Battalion Chief Shem Hawkins (left) was in a helicopter on air attack within 30 minutes of the Camp Fire starting. He described to city officials how extremely high wind speeds made fighting the fire from the air ineffective. Right: Ron Quigley, Interim Regional Administrator, CA Governor’s Office of Emergency Services, Inland Region (Law Branch). Huh? An exhaustive article describing the horrible path of destruction caused by the fire, but not one sentence dedicated to climate change or the electric utility’s supposed fault for the inception of the flames? Seems like our city officials are STILL bent on scaring us locals into under grounding our electricity on the backs of taxpayers and not SCE or PG&E. Could it be that some of those ‘thousands’ of downed power lines and poles were antiquated, not properly maintained or replaced as to continuously prop up the bottom line to pad the wallets of Big Energy and their cronies? The investigations continue and only time may tell. And please city of Laguna next time you send a contingency out to investigate to bring home valid ideas to apply to our lovely city, send a well-rounded group of individuals that include scientist which are knowledgable about climate change and investigators who are privy to the debacle produced by delayed maintenance of our antiquated power grid.